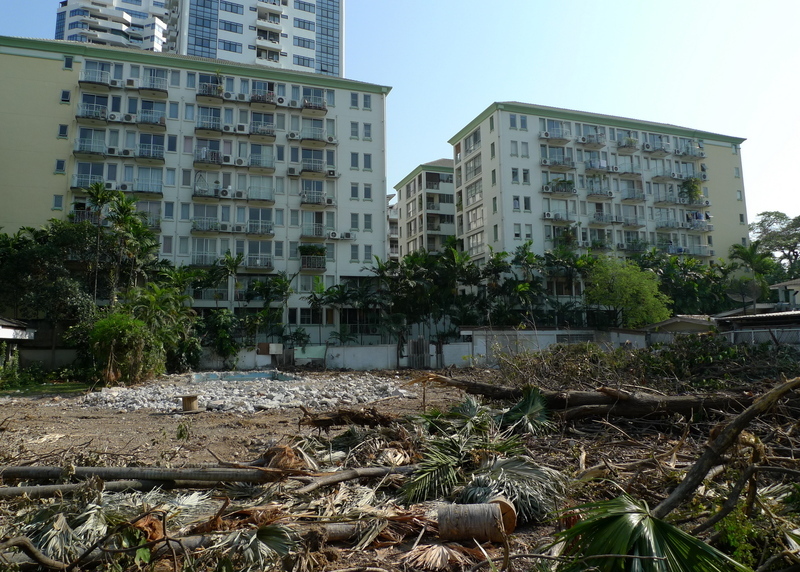 Last December I wrote about some of the changes happening to the landscape in the Thong Lor neighborhood of Krungthep (Bangkok), where Tawn and I live. 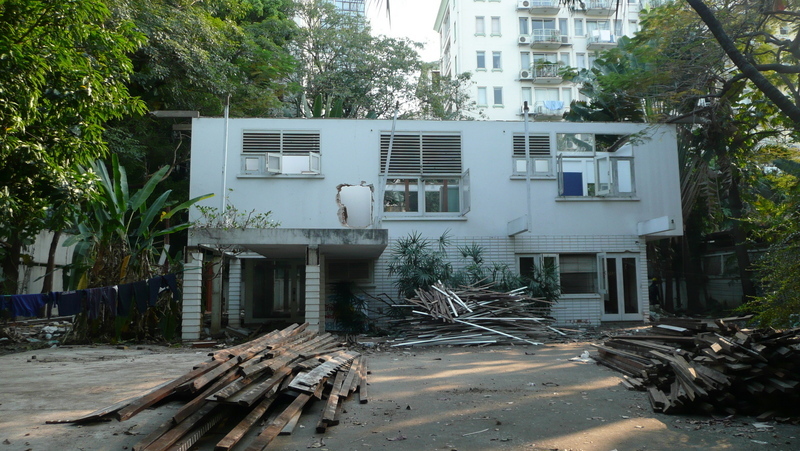 Most notably, for selfish reasons, is the demolishing of two houses adjacent to our condo. One Sunday morning last December laborers started demolishing the internal structure on this first house. You can see our condo building – one of two U-shaped buildings that face each other around a swimming pool – in the background. Thankfully we live on the back side of the building from this picture so the noise and dust didn’t affect us all that directly. But like any property owners, we were curious what was going on. Was this adjacent property going to become a thirty-plus story monstrosity like the one to our southeast? A few days later, heavy equipment came in and the building, an old single-family home dating from the 1960s, was razed. Once most of the rubble was carted away, everything was quiet for several weeks. Then about a month ago they started the same process with another house in the property to the left of the one pictured above. 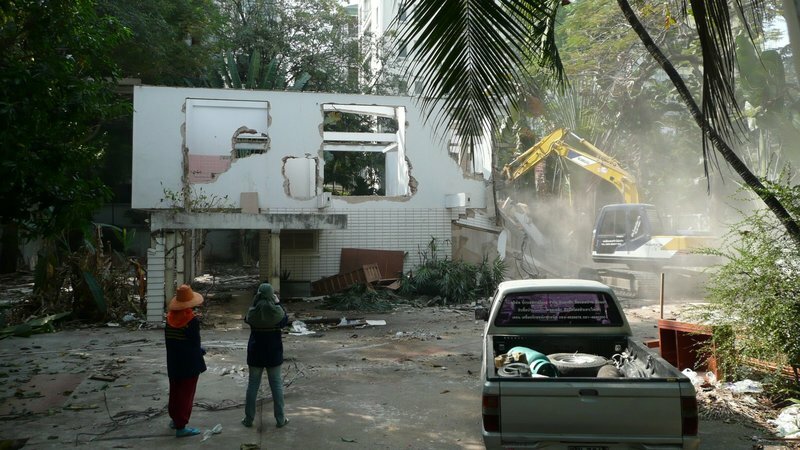 On behalf of the panicked residents, uncertain about what was going to be built just outside their balconies, the homeowner’s association pressured the juristic office to contact the Wattana District office. The news came back that the properties are owned by an elderly woman who is building houses for her two sons. There would be no large condos, just new single-family homes. Of course there are plenty of examples on our street of “single family homes” that become extended family six-story apartments. Then two weeks ago, once again on a Sunday morning, the construction crews arrived and started cutting down all the trees and vegetation on the two, now one since the wall between them had been demolished, properties. A few days later they also cut down two beautiful old trees that were at the back of their property, situated so that they provided a nice green backdrop for our pool area. Last Sunday morning was the annual homeowner’s association meeting. 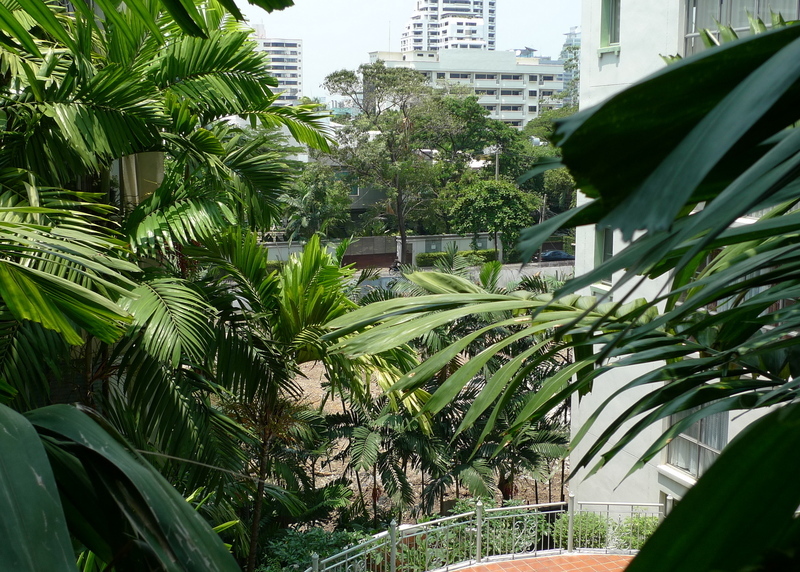 At the meeting, the head of the association, a Thai man about my age who lives in the mirror image condo from ours on the same floor, explained that he had personally contacted the homeowner and offered to compensate her for the trees so that they could remain standing. The view from our balcony now includes a clear view of the denuded property and the soi (alley) beyond. There used to be two really beautiful trees that would put forth these large pink blooms twice a year. I’m hoping they will plant some new landscaping but it could take a decade to get our verdant view back. At this homeowner’s association meeting there were four vacancies for the committee. Three people, including Tawn and a British expat who has lived here more than seven years, volunteered for the positions. One of Tawn’s big issues is greenery – both aesthetically and also since it affects our property value – so I’m sure this will be an issue that gets addressed at the next committee meeting. Also, the British guy (John) and several other people have offered to help pitch in money to plant trees on our side of the property to replace the ones cut down. We’ll see how that goes as the planter area is less than a meter wide, so I don’t think the large root ball of a tall tree could be accommodated. Anyhow, we’re feeling more exposed these days, now that our neighboring land has been denuded. This entry was posted in Uncategorized and tagged Bangkok, condo, Environment, Green Space, Krungthep, Thong Lor, urban planning by christao408. Bookmark the permalink. This sounds similar to what’s in my neighborhood, except that our neighbors are complaining at each other about their trees blocking the view. Also, the homeowners assoc. is against new developments of huge houses. Yeah it’s too bad that the trees got cut down. oh wow :[that’s really sad to know. Tearing them down is sooo much fun. Sad as it is, it’s like that in many neighborhoods. People want space instead of the natural beauty. Trees being cut down for “convenience” is just wrong! A pox on the old woman and her lazy sons! What they cant skim the pool? meh. @murisopsis – So much for environmental awareness, huh? @notjus4ne1 – I was flying into Atlanta a few years ago on business and noticed some new housing developments where they had bulldozed acres of gorgeous woodlands in order to build new suburban homes, and then planted little scrawny trees in the front years of the homes. I can’t believe that saving a few of the trees wasn’t an option. Of course, this isn’t unique to Atlanta nor even to the US. @stevew918 – Well, yes, at least they will be smaller buildings. @Justin_DeBin – Really? Seems like a lot of work. @elelkewljay – @yang1815 – Yup. @Dezinerdreams – Oh, do you? Heh, heh…@CurryPuffy – Yeah, with your neighborhood I guess the view issue is particularly important but the trees are necessary for privacy, otherwise people further up the hill can look in on you. @Redlegsix – Right now, the station Tawn travels to is just outside the protest zone. Seems like the troops are making some movements to tighten entry and exit into that zone so don’t know if they are going to try and take some action soon or not. That’s a sad take on keeping the earth green. If the lady can’t “afford” a pool boy, they have skimmers that do the work automatically, all year round.My sister has one in her pool in FL. May be you should put up some neon lights on a big bill board across from your condo, so those guys will be forced to palnt some trees to avoid looking at the blinking lights. j/k.Good for Tawn to take the initiative to become the Board member. Way to go! Oh gee… I want a pool boy too (and my condo doesn’t have a swimming pool). But seriously – this is asinine. I hope the new owner gets flogged for this. @ElusiveWords – Nobody to do the flogging, sadly. Would you like me to send you a pool boy for Christmas, though?